Don’t underestimate the advantages of soft water! Like a lot of business owners, you might be wondering, “What are the benefits of a water softener?” It’s important to understand that if your water isn’t softened, you can run the risk of causing damage to your critical infrastructure – and that means more money out of your pocket, both short and long-term. We’ll take a look at why you should be using a water softener system to benefit your business, your equipment and your bottom line. But first, some basics. It’s safe to assume that the water piped into our homes and businesses, either from a well or a municipal treatment facility, contains naturally occurring soluble minerals. These minerals make the water “hard.” Soft water is water that has been “softened” to remove these minerals. Almost all water that isn’t softened is considered to have some degree of “hardness,” which means there are minerals present in the water. True soft water is water completely devoid of soluble minerals and is referred to as ZERO grains hard. If you’re using well water in your business, you can be almost certain that your water is hard and should be softened. But even if you’re using city water, it’s important to understand that your water is not truly soft because municipalities don’t use the resources required for true soft water – they leave that up to the end user. In this case, that’s you and your business. For example, City of Milwaukee water is 5 to 9 grains hard and considered only “moderately hard” by national standards; however, moderately hard is definitely not true soft water. In comparison, Brookfield, Wisconsin city water is 23 to 34 grains hard, meaning Brookfield water is much harder than Milwaukee water, but neither water supply is truly soft. And Wisconsin isn’t the only state with these variations in water hardness. Our neighbors in Indianapolis, Indiana have city water that ranges from 12 to 30 grains hard–so even their lowest level exceeds moderately hard. To get true soft water, you need a water conditioning system, i.e. a water softener. In short, your water softener works by using charged resin beads to attract minerals in the water and pull them out of the water, making your water “soft” and generally safer for your water system. We can use the technical terms “ion exchange” and “regeneration,” but it helps to use an analogy to understand the process. Picture a large swimming pool filled with water. Now picture millions of paperclips floating in that water. The paperclips represent the minerals in our analogy. Next, imagine a giant magnet sucking up all of the paperclips – this magnet is akin to the salt in the water softener. In the softener system, the salt acts like a giant magnet attracting all of the mineral particles. Once the mineral particles (or paperclips) are sucked out of the water by the salt (or giant magnet), they need to be disposed of – or sent down the drain. This is the “regeneration” part – flushing those minerals (paperclips) out of your water system completely. When this process is complete, you’re left with “softened” water – or water without minerals. Note: It’s important for everyone, both commercial and residential applications, to use solar salt and ONLY solar salt in a water softening system. Solar salt is comprised of salt and salt only. However, rock salt – a product commonly used to salt driveways and sidewalks in winter – contains minerals along with the salt. It doesn’t make any sense to use rock salt in your softener because the minerals contained in the rock salt will add minerals to the water, when your goal is to remove minerals! Using rock salt is bad for your water softener as well, forcing it to work even harder to remove the calcium and magnesium from the water. What are the advantages of soft water for my commercial equipment? To understand why you should use a water softener in your business, especially for your commercial water heater, you first need to understand the negative effects of heating hard water. When hard water is heated in your commercial water heater, the minerals in that water are precipitated (or pulled) out of the water and deposited in a solid form. Those minerals land on whatever surface they touch – such as the dishes in a dishwasher, the insides of pipes in your plumbing infrastructure, or the bottom of your water heater tank. If you’ve ever taken glasses out of the dishwasher and noticed spots on the surface of the clean glass, sometimes called “water spots,” those are the mineral deposits. Or, say you’re boiling water in a pot on the stove. If that water is hard, you’ll notice mineral accumulation on the bottom of the pot. A less visible, but potentially more problematic example of these mineral deposits can occur inside your pipes and your water heater, and over time these deposits can cause both clogged pipes and ruined water heating equipment. Hot water shut-off valve completely blocked by sediment build-up, aka dried mineral sludge. It’s these mineral deposits resulting from heating hard water that makes softened water absolutely critical to protecting your water heating infrastructure. Hard Water = Serious Damage To Your Water Heater & Your Plumbing! 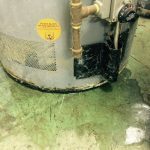 Mineral Sludge – Picture this: you’re running hard water through your commercial water heater on a regular basis. Like boiling water in a pot, those minerals are slowly (but surely) accumulating on the bottom of the tank. After a while, we’re not just talking a few flecks of floating particles, you’re looking at an all out mineral sludge on the bottom of that tank, growing larger and larger by the day. So, that heat produced by the flame underneath the hot water tank needs to work through all those layers of muck just to heat the water on top of it. To use another analogy, it’s the difference between simply heating a pot of water on the stove and placing a brick between the pot of water and the flame. With that brick in the way, the flame has to heat the brick first in order to heat the water. Talk about a waste of energy and money! This means your water heater is working overtime (using more gas) to heat up the tank. Plus, the more sludge in the tank, the less water your water heater holds – resulting in a growing energy efficiency problem and more money-related headaches for you. Popcorn, Anyone? Has your commercial water heater ever sounded like a popcorn machine? Well, that’s a symptom of mineral sludge! That sludge has little air pockets in it, like a honeycomb. This means the water that seeps into those little pockets on the bottom of your water heater is heated so fast it actually flash boils, creating a loud POP when it releases a burst of flash-heated steam! If you’re hearing a popcorn sound coming from your water heater, you need to install a water softener ASAP. Limescale buildup on the inside of a heat exchanger pipe. Photo courtesy of Wikimedia Commons. Boiler Benefits – Do you have a boiler as part of your water heater setup? If so, you have one more reason to use softened water. Sediment in a boiler can clog the heat exchanger, (the tube inside the boiler responsible for keeping the water hot) and eventually that heat exchanger will give way and spring a leak. Then you’re left with a water heating system that can’t maintain hot water and a very large leak to clean up. Low Pressure Problems – Low water pressure can be caused by a lot of things, but oftentimes a reduced flow is the result of mineral buildup in your pipes. With hard water build-up over time, a half-inch pipe can become a quarter-inch pipe, then an eighth inch pipe, and eventually become completely blocked. This process usually takes decades, but if you’re in business for the long haul, eventually you will end up paying a high price to either have your pipes cleaned or – even more costly – replace them all together. Don’t let hard water flush your money down the drain! That sludge-formed popcorn machine isn’t just bad for your water heater – it’s bad for your entire water system. The minerals that aren’t left on the tank bottom are free to roam around your water network, sticking to everything in sight: meaning all your valves, fixtures and pipes become clogged with mineral deposits. More energy costs on a day-to-day basis. Quicker turnover rate for your commercial water heater (frequent replacement due to damage). More costs associated with replacing other pipes and fixtures throughout your establishment. What are the benefits of a water softener in my industry? To be clear, all business that use water heating equipment (like a water heater or a commercial boiler) will benefit from using soft water, though each industry can benefit from different softened water applications. There are two types of water heating systems, called “hot-only” and “whole-line.” The hot-only option is a water softener for hot water only, meaning only the water that gets heated is softened. Whole-line, which is common in most homes, means both hot and cold water are softened. In commercial applications, some businesses will use whole-line, and some hot-only. As a restaurant owner, you want softened water running through your water heating system, as well as your dishwasher, sanitizer, steam table, and any other large/expensive pieces of equipment which use high volumes of hot water. Additionally, you don’t want those unsightly water spots on your glassware or silverware. It’s actually much more cost effective to invest in a water softener than to pay someone to wipe off those spots. However, you may not want softened water running through your cold lines – the lines that feed your drinking water, coffee and tea machines and your soda gun systems. This is because softened water can taste different than hard water – and not in a good way. Soda fired from a gun loaded with soft water can be a lot less fizzy, too. As a result, most restaurants will use a hot-only system to protect valuable equipment, as well as to simultaneously ensure beverages taste as delicious as possible. Note: Hard water only causes sediment buildup when it’s heated or evaporated. So as long as you use your cold water on a daily basis, your pipes should remain buildup free. Restaurant owners with hot-only systems need to remember to clean, or de-scale, their coffee pots from time to time. Since the water going into the coffee maker is cold and therefore has not been softened, some mineral buildup may occur. We’ve probably all experienced the difference between showering in hard water vs. soft water. Showering in softened water can leave a “slippery” feeling on the skin, which can translate into a belief that the softened water didn’t actually wash the soap off or even that it left a soap residue behind. In contrast, hard water gives the impression of washing away the soap completely, leaving a squeaky clean feeling on skin and hair. The tricky reality, however, is that due to chemical reactions between the calcium and magnesium in the hard water and the soap, a hard “curd” will form along with the suds in your lather. This curd actually lodges in your pores and dries out your skin. Although you feel cleaner with hard water, your skin actually is overly dry and often covered with residue. With softened water, the sodium in the water is combined with the suds, but no curd is formed. Sodium does not lodge in your pores and rinses clean away. The “slippery” feeling is actually your well-hydrated skin! Because of these chemical reactions, soft water requires less of things like dish soap, shampoo and laundry detergent to get things clean. And of course, less product equals more savings! How do I set up the perfect water softening system for my business? As with most types of equipment, you want a water softening system with the size and specifications to fit your business’ specific needs – not just a one-size-fits-all approach. At Reliable Water Services, we ensure that the water heating and softening system we specify for your business is exactly what you need–without any waste or cutting any corners. We also offer a free chemical test, which tests your water for 40+ different chemicals including: pH, iron, chlorine and lead. This gives you an accurate picture of your water, so together we can ensure your business has all its water needs covered. Of course, water can change based on the actions of a particular municipality, so it’s important to retest every year and stay on top of the changes in your water. The bottom line: installing a water conditioning system to soften your water is of serious value to the life of your entire water system, including your commercial water heater, fixtures, piping, valves and more. So don’t underestimate the value of soft water for your business! Soft water is going to save you money across the board and keep your equipment functioning at peak performance. Image courtesy of Flickr user Aqua Mechanical. In-post photo courtesy of Wikimedia Commons. Photo “Water Softener Salt” courtesy of Flickr user HomeSpot HQ. Photo “Kitchen Sink Drain” courtesy of Flickr user Aqua Mechanical. Water damages needs immediate attention to reduce more losses. just in case a water injury happens in your home or property attempt to find the matter. By doing therefore you’ll facilitate stop more damages. Many home owners are opening their eyes to the benefits of soft water. However, there are still plenty of home owners who do not even know what soft water is. They have no idea that the conditioning of the water in a home can improve the cleanliness of dishes, clothes and even skin. Using soft water can eliminate the rings that grow around a bathtub or sink. Soft water is the best option to use in bathing because it soothes our skin and it is the answer for patients with eczema. It can also be used in washing the dishes as it has a detergent component which would really enhance the cleanliness of it. As your said, hard water is so harmful no matter for commercial water supply or home water supply. It is necessary to soften hard water. Taking time to read the instruction manual is the most important thing to do when owning a water softener. Every water softener has its own special features and advantages over the others. I think its best to get your system installed professionally, its the only way to guarantee it gets done properly. Yeah i with Megan I have heard horror stories of where people have installed the system themselves to save a bit of money and it has cost a fortune to repair. Soft water gives a soothing sensation to the skin and is a healthy alternative to hard water which can be harmful. A Water softener has many benefits, however in order to avail them you need to know how to use it. I would recommend using a water softener in combination with a pre-filter in order to ensure that the water does not cause damage to equipment. When you buy a new house it’s important to measure the water hardness or softness. Using hard water can be daunting for hair and skin. It’s crucial to do this type of job using a water purifier expert. You need to use clean and clear water for your house. For drinking you also can use reverse osmosis water for healthy life. A part from extending your appliance life, soft water can be heat more faster in the process reducing energy consumption and Lowering utility bills. Many thanks for the uplifting message. Definitely! if you don’t soften your hard water it will be more costly for you in the long run compared to just installing a water softener which is a minimal investment. I recommend using a saltless water softener as well specially if you don’t have extreme case of hard water because the water tastes great! Due to the fact that environmental pollution becomes a more and more important factor for health issues, I always recommend people to use RO system to filter their tap water and make it health and clean drinking water and, above that, use a water softener to keep your pipes and valves clean. Totally agree with you that hard water is very dangerous for the water-based equipment.And that’s where water softeners help us a lot. So true – thanks for taking the time to read and comment! Well, We all know how scarce it is to find pure drinkable water nowadays. If you ask me I would definitely suggest RO system. As it is safe and efficient. I also read somewhere that RO system can make sea water drinkable. So that’s a huge plus. I personally feel that people need education on the effects of hard water and soft water as it seems to be something very uncommon and people keep experiencing the harmful effects of hard water without even knowing it. So, What do you suggest as hard water solution? Water Softener or Filter?? Which one will provide good soft water to drink? Good question, Bella! A water softener is necessary to solve your hard water problems. A filter can only do so much on its own. The best system, especially for drinking water, is to have a softener as well as an additional filter for drinking water. If you have a newer style refrigerator that has a water dispenser, it will already have a filter in it. It is recommended to change those filters every 6-12 months depending on your consumption. Alternately, for commercial settings especially, we recommend a Reverse Osmosis (RO) filtration system for drinking water, as that will remove additional impurities from water that a softener can’t, including most of the sodium left behind as a result of the softening process. Thanks for the comment; hope this helps! Nice post on water softening.I really liked your mention and keep on visiting.We provide Commercial water softeners.For More information please contact us.